Yesterday we heard that the Supreme Court reinstated the Muslim Ban and lifted the injunctions granted by the Fourth and Ninth Circuits. This decision will inevitably give permission to the president and all those likeminded to heighten the negative rhetoric used to legitimize the fear and hate that has already heightened around all Muslim communities. We will once more learn how Customs and Border Protection will interpret the orders from the Department of Homeland Security broadly and watch them overreach, as they have since January. The individuals from the six Muslim majority countries (Chad, Libya, Iran, Somalia, Syria and Yemen) will face a variety of challenges that lay ahead. As we look back on this year, you’ll find that a number of civil liberty organizations have fought hard against the decisions made by the Department of Justice, trying to dismantle the illegitimate memorandum that has been interpreted as unconstitutional in some of the lower courts. While a number of non-governmental agencies are fighting against the messy rollout of Trump’s memo and a wide network of other advocates have been trying to make sense of the White House’s decision, there are still rights being violated at ports of entry. The Department of Homeland Security leadership has been withholding an internal watchdog’s report detailing the government’s mistakes during the rollout of the travel ban, including the violation of two federal court orders. Inspector General John Roth released a number of details evaluating these violations through testimony and analysis in a report that he has been waiting to release since first submitting to DHS leadership back in October. Almost all information to this degree generally becomes public after review, but Roth admitted to being troubled that DHS leadership was holding the report and reviewing it for “deliberative process privilege” (a power that the department has almost rarely used in its entire existence), which would prevent his office from releasing significant portions of the report. DHS has been the full force behind the implementation of the ban, but has repeatedly denied the release of CBP’s standard operating procedures since the rollout. Details of the report that were released showed that Customs and Border Patrol could not answer some of the most basic questions regarding the ban, including whether or not the order applied to lawful permanent residents. The report and investigation state that while CBP complied with court orders at ports of entry, where travelers had already arrived, the agency was very “very aggressive in preventing affected travelers from boarding aircraft bound for the United States” and violated two court orders prohibited them from that activity. Every airline except Lufthansa obeyed the no-board instructions from CBP. In addition to that, CBP continued to issue no-board instructions to airlines even after a nationwide court order on Jan. 31 temporarily blocked parts of the ban. Though opinions of internal members of DHS are conflicting, Tyler Houlton, DHS acting press secretary, said that the Department’s officials have been “conducting themselves professionally” and that material within the report is covered by “privileges afforded by the well-recognized law [deliberative process privilege]”. He also explained that complications and violations of the law were “inevitable,” as implementations of the Executive Order were conducted amidst a number of lawsuits and court orders. It is evident as it has been in the number of lawsuits and challenges brought out against the Muslim Ban that the implementation is confusing and dangerous for the thousands around the world seeking refuge and opportunity in the United States. In January, the administration claimed that it was upholding America’s ideals and protecting the safety of the American people. 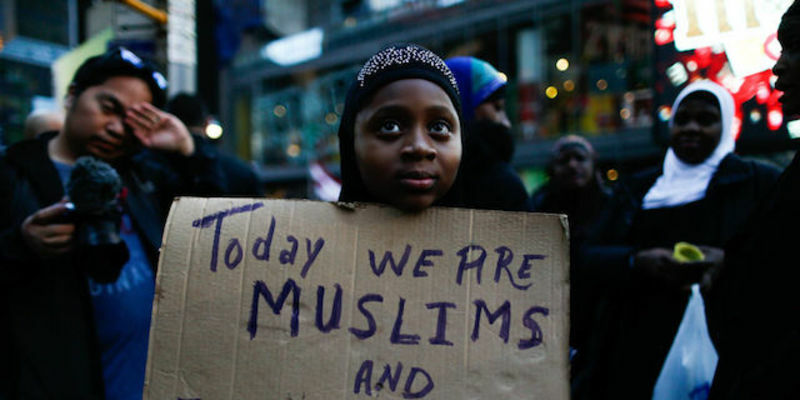 However, at its core, this is an attack on the Muslim community and on true American values. A Palestinian American trying to eradicate all civil injustices.